Amitabha, by the power of his grace, reconstructed the body of Chenrezig. He gave him eleven faces and a thousand arms similar to the thousand spokes of a universal monarch’s wheel and a thousand eyes, symbolic of the thousand buddhas of the present kalpa. 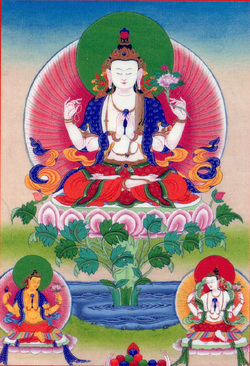 Chenrezig could henceforth help the beings in this form as well as with his other forms of two or four arms. Amitabha asked Chenrezig to retake his promise with still more vigor than before and then transmitted to him the six syllable mantra: OM MANI PADME HUNG." It is said that all the teachings of the Buddha are contained in Chenrezig's mantra, OM MANI PADME HUNG, and it carries with it the power to purify our mind's obscurations. We develop the enlightened quality of compassion through Chenrezig practice and mantra recitation as well as by compassionate conduct toward all beings. Chenrezig is renowned as the embodiment of the compassion of all the Buddhas, and is known by many different names, including Avalokiteshvara in India, Kuan-yin in China, and Kannon in Japan. He is sometimes depicted with two arms, but most commonly with either four arms or one thousand arms.